Despite the fact that Sunday was Superbowl XLVII, one of the top trends on twitter Monday was Richard III. 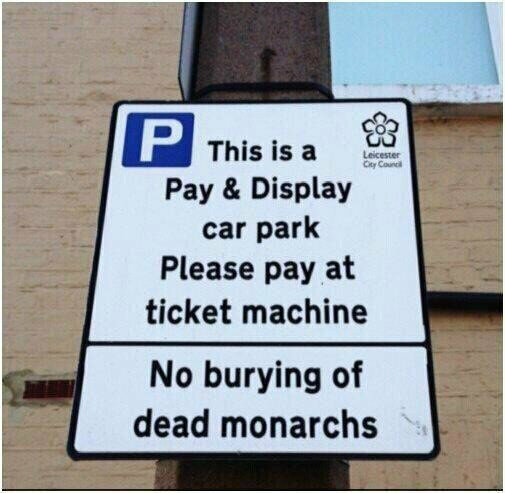 Beginning Monday morning at 10am GMT, a press conference at University of Leicester revealed that the bones that were discovered last September in a car parking lot in the British Midlands were indeed those of Richard III. Richard III was king of England from 1483 to 1485 through a series of potential shady proclamations regarding the marriage of Edward IV and the birthright of Edward V. Supporters of Edward IV rebelled against this accession. This was part of a series of fights between the House of York and House of Lancaster for control of the throne of England, known as the War of the Roses. In 1485, Richard III faced Henry Tudor on the battlefield at Bosworth. It was the final battle in the War of the Rose. During the battle, Richard III was knocked off of his horse, and suffered numerous blows to the head causing his death at age 32. It was unknown for five centuries what happened to his body. That is until last September when an archaeological excavation in a car park revealed the remains of the Grey Friars church, thought to be his final resting place. Further excitement began when the remains of an adult male with scoliosis and multiple traumas was found in a nearby. 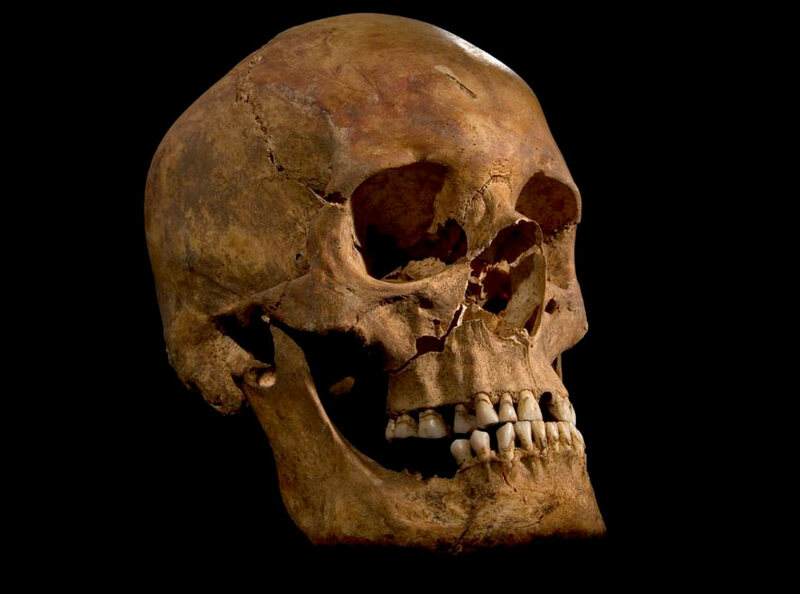 The individual was dated from 1455 to 1540, died in his late 20’s or early 30’s and had a more gracile body (consistent with descriptions of Richard). The spine had an unnatural curvature suggesting scoliosis, one of the major defining traits of the late king. The skeleton had ten major wounds that were received around the time of death including 8 to the head suggesting that his helmet was lost. The skull showed that a blade had hacked away the rear of the cranium, a potential cause of death. Given the consistent age, body shape and the battle wounds, Jo Appleby, the osetoarchaeologist on the project, argued that a fairly conclusive case could be made for his identity. Facial reconstruction further added to the case for his identity since it was done without knowledge of who he actually was and with the help of computer modeling to produce an unbiased image. Monday they announced the results of the DNA testing. Michael Ibsen is a Canadian-born citizen and a direct descendant of Richard III’s eldest sister, Anne of York. It was his DNA that was compared against the possible king. The DNA showed it was in fact a male and was related to Michael Ibsen. Richard Buckley, lead archaeologist on the project, stated that “beyond reasonable doubt the individual exhumed at Grey Friars on September 12th is indeed Richard III, the last Plantagenet king of England“. Immediately this led to discussion on Twitter and the website that was live-updating on the report. There were questions of the historical significance and whether the hype regarding the identification was necessary. As the day wore on, there were questions over the interpretation and results. One argument is that this will aid in renewing interest into the period and will help combat Shakepeare’s version of the story, which is slightly misleading and portrays Richard III as the only criminal during the war (As one comment notes in a Time article, even the author doesn’t differentiate the play and reality). There is debate over where he should be buried, with the current location set at St Martin’s Cathedral in Leicester, but arguments for a rightful burial in Westminster Abbey or Windsor Castle with other monarchs. There is also the question of the accuracy of the DNA test. Comparing mtDNA means that there would be similarities between Ibsen and Richard III if their mothers were related. However, the more generations you go back the higher likelihood there may not be direct relatedness. Two people can have the same mtDNA type by chance, it doesn’t always mean common ancestor. The question then is how rare is this type of DNA, and is the test accurate- something we will only find out when they publish the complete academic journal article. Personally, I’d have to agree with Kristina Killgrove. The evidence appears to stand up to scrutiny, they definitely have a lot of different lines of evidence to back up their arguments, and until we see the final paper we can’t really draw final conclusions. However, until the publication is released, you’ll just have to enjoy the great responses that people are having to this event on Twitter. And this music video from Horrible Histories. The TV and news coverage here in Britain of this fascinating episode has almost drowned us. You’ve covered the events comprehensively and well but are a bit confused about some details. The Wars of the Roses is a complicated period of English history that gave me headaches as a schoolboy; it ended the Middle Ages in 1485 at the Battle of Bosworth near Leicester when Richard III was killed, but the War of the Roses didn’t begin only two years before when Richard III made his grab for the English throne. In fact the War of the Roses began about 30 years earlier, in 1455, with the first battle of St Albans. That’s not quite true – there were instead competing accounts of what happened to the king’s body. One historical account was that it was buried by the monks of Grey Friars in their Leicester priory church, another said his naked body was thrown in the river of this county town. The car park excavation was therefore a very long shot attempt to see if the first account might be true. The chances of any archaelogical excavation finding a specific person’s body around 500 years later and proving this are miniscule. They dug three trenches and part of their first trench coincidentally happened to slice through the site of the choir of the Priory church, precisely where he was buried. Almost the first find were the leg bones. The feet are missing because in Victorian times they were destroyed by the construction of an outbuilding. It was lucky the rest of his skeleton wasn’t also destroyed. Prof Wilkinson said the Dundee team artist, Janice Aitken, only used the portraits of Richard III *at this stage* as reference for hair style and colour, eye colour, skin colour and clothing. The news we have all been waiting for. I was hoping you would weight in on this discovery. The multiple lines of evidence almost seemed too perfect at first – I mean, really, how often do you get that much evidence to identify the lost grave of a notorious historical figure? I didn’t know about the second DNA! Thanks for all the insight into the issues. I think we’re all excited to see the peer reviewed report. Peer review is out of date and out of touch! It is expensive and often biased! The most vicious biased people who enjoy putting other people’s work down are to be found in the so called academic and scientific community. Peer review is also unreliable and one person can find a paper well presented and another find it confusing. As papers are hardly written in English, they are not really for the general public, so why not being the evidence at its most basic and easiest to understand to the public at the point that finds have been confirmed or not? Why hide something for months while it is peer reviewed? The public are highly critical and suspicious these days and any scientist hiding a find of this importance would be accused of doctoring or hiding the results. That is just the way it is. The DNA is not controversial, despite what some genetics say. The search for a match took several months and they have studied the bones closely. More studies are being done. There is also a danger with rare things like peer reviews that bias will creep in. The papers will be reviewed, but I still think the University of Leicester knows what it is doing. 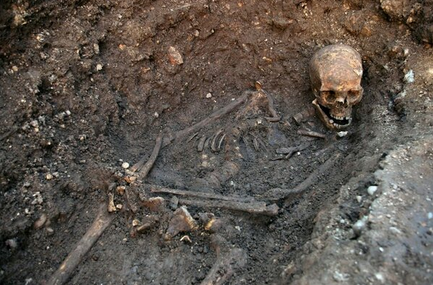 The DNA was only the icing on the cake: other evidence showed it was Richard III. By the way French scientists have dug up Richard I, and looked at his heart. Who will be next? Very true, there are problem with publishing and peer review. I think the reason people want to see the journal article is so they can independently assess the evidence. I think the skepticism is over the popular press releases and news rather than the evidence itself.